the box is then returned to the shelf. There is no doubting that advertising agency JWT have come up with a clever scheme. The idea is already receiving extensive media coverage, and may just be novel enough to prise a few more pounds out through those tightly laced recession purse strings. It may do some good for the cause of Alzheimer’s, and it will certainly do the agency themselves no harm. Seriously, though – doesn’t it strike you as slightly odd? How many pounds will be involved in the construction of the boxes, how much carbon released into the atmosphere transporting them, and how many hours spent putting them on and off the shelves? We may need this kind of novelty to persuade us to give, but should we? There is one other small problem too – see below the photo. 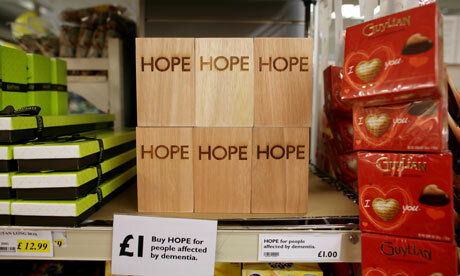 Where exactly would you place ‘hope’ on the shelves? In the photo above it is sandwiched between the chocolate boxes. However, the scope is endless. You could put it by the newspapers – where people are reminded of the needs of the world. You could put it next to the staple foods to guarantee maximum exposure. You could put it next to the cleaning products or home improvements – where people are thinking about making things better. Maybe my imagination is running away with me – after seeing men’s underwear displayed in the wines & spirits aisle in a supermarket yesterday, anything is possible!